For the Allies, speed and versatility mean staying one step ahead of the enemy. With the Recon Boys expansion, you can outfit your squads with the ability to adapt to nearly any threat. 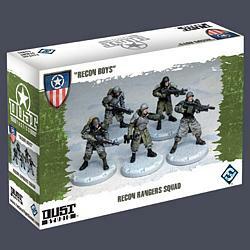 Recon Boys excel at their primary task: scout, infiltrate, and capture. Their speed allows them to quickly find cover or control a strategic location, which makes up for their lack of firepower. Recon Boys carry a Victory machine gun that can cut through enemy troops, but with no anti-tank armaments, beware leaving them alone against armored units. Bring these new troops to the battlefield and decide the fate of the world!